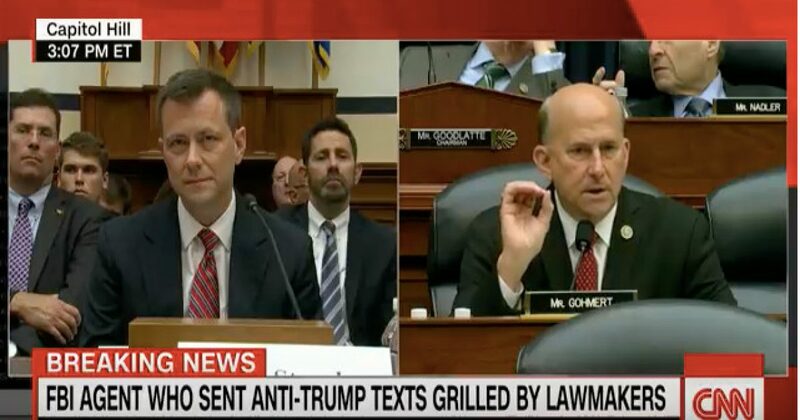 Texas Rep. Louie Gohmert spoke during the congressional hearing for FBI agent Peter Strzok, stating that the Intelligence Community Inspector General found tens of thousands of emails from former Secretary of State Hillary Clinton that went to an authorized foreign entity. Strzok, of course, played the whole thing off like he didn’t have a clue what the guy was talking about, a move that didn’t end up going in his favor. “I do not,” Strzok replied. “Now do you remember it?” Gohmert asked. One thing’s for sure. Strzok has the absolute perfect face for some sort of wacky Bond villain. Just look at his expression in the video. Is that not diabolical? Anyway, we all know that Hillary is corrupt to the core, but apparently so are many of her sycophants. What’s truly tragic is how Clinton has managed to get away with so much over the course of her career. People like Strzok are a disgrace to the FBI because they are to set aside their personal politics and stand up for truth and justice, holding all people accountable to the law. He and many of his coworkers have failed in this basic duty. It’s time for this to change.